World Land Trust (WLT) multimedia consultant, Luciano Breves, who lives in Brazil and manages our webcams on the REGUA and Fundación Jocotoco reserves, as well as his own in southern Brazil (the Ornithos webcam), tells WLT why winter in South America is the best time for birdwatching. Winter has just started in Brazil and the cold weather has already arrived in the south and south-east of the country. Temperatures at REGUA never get too cold – lower temperatures will be around 10˚C and in Parana State in Southern Brazil where the Ornithos webcam is located, temperatures will hardly go lower than 7˚C. The vegetation will stay green during our winter but less food is available for the animals living in the forest and that makes it the best time to watch birds on the webcam feeders. From big Guans to tiny Dacnises several fruit eaters are now coming to our live feeds. Sometimes you will see six to seven species at once. 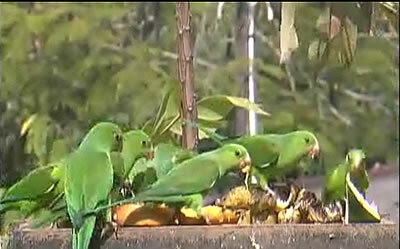 Big flocks of Maroon-bellied Parakeets (Pyrrhura frontalis) often appear on the REGUA webcam and Plain Parakeets (Brotogeris tirica) flock to the Ornithos feeders. The Red-billed Curassow is an endangered species and was reintroduced to REGUA in 2007 and now regularly visit the webcam. Endemic species such as the Black-backed Tanager (Tangara peruviana), Brazilian Tanager (Ramphocelus bresilius), Black-legged Dacnis (Dacnis nigripes) and others are also regulars now – I count about 30 different species on a normal day. The Marmosets are still jumping onto the REGUA webcam a couple of times a day, and at night we’ve been watching the Great Fruit-eating Bat (Artibeus lituratus) attacking the bananas on the Ornithos cam. I think I have also seen the Flat-faced Fruit-eating Bat (Artibeus planirostris) make an appearance – I wonder if anyone else has? I am always keeping an eye out for new or uncommon visitors so if you see something different please send us a screen shot! You can upload any of your screenshots to our Flickr group.